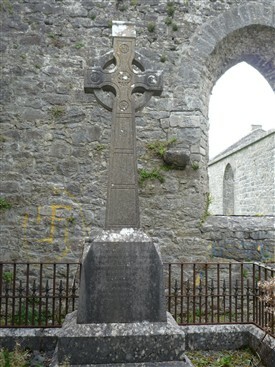 Replica of celtic cross memorial to members of the Kilkelly family, who had a business on Main Street, Ballinrobe. Laneway off Brewery Lane leading up towards site of old Church at back of Bridge Street. This ruin of a Church was originally a large, slated building erected in c. 1819 by subscription, with Lord Tyrawley (Cuff) donating an acre of land and £50. 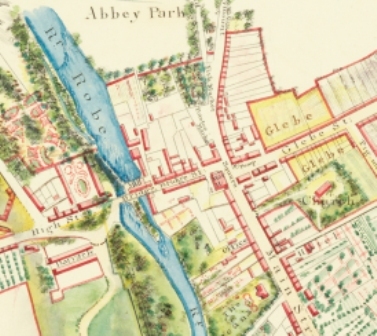 In a descriptions of Ballinrobe from "A Topographic Dictionary of Ireland " by Samuel Lewis, in 1837 he states that “the R.C. parish is co-extensive with that of the Established Church; the chapel, a large slated building with a lofty square tower, was erected in 1815 by subscription, toward which the late Lord Tyrawley gave £50 and one acre of land". There is a doubt that the tower was built at the same time as the Church and may have been a later addition c. 1827. This was "a free standing cruciform-plan, rubble stone Church, having two transepts," according to Mayo Council’s protected structure no. 088." This design is called a "Latin Cross" ground plan with the arms having the title of transepts. The original slated roof and timber joists were removed and relocated to the boy’s secondary school behind the current Parish Centre (formally Charter School) on Cornmarket. The original design of the roof timbers result in the steep pitch on this school roof. There is a very tall tower located on site with numerous crosses on it battlements. 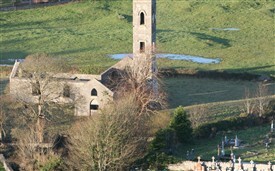 This was no doubt, that the Church of Ireland had the better location within the town and on higher ground. 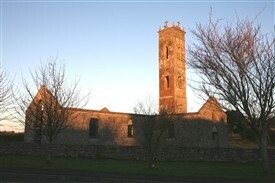 This is often cited as the reason for the very tall tower which would have been widely visible from a distance, therefore giving a similar status to the tower of the Church of Ireland. The location, out of town, probably was a factor in the decision to build the new Church of St. Mary's in the heart of the town with its foundation stone being laid c. 1851. 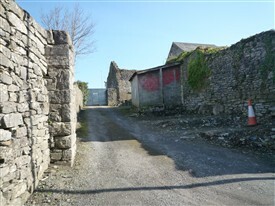 The preserved gate piers on the Castlebar Road are diagonally set with the gates usually locked, but there is easy access for walkers through a stile close by. There is confusion about the Church’s start up date with Dean D’Alton suggesting it opened in 1819. 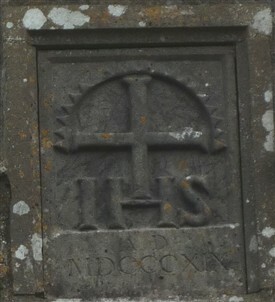 As the plaque above the entrance is dated 1819 (MDCCCXIX) one can presume this reenforces Dean D’Alton’s suggestion, and was probably installed with the completion of most of the work, and with its opening. James C. Curwens (1756-1828) states that a “large Catholic Chapel is now erecting but some difficulty has occurred in procuring funds for its completion” in his book Observations on the state of Ireland, principally directed to its agriculture and rural population; in a series of letters written on a tour through that country, published by Baldwin, Craddock & Joy, 1818. This would confirm that an 1819 opening would have been possible. This could cause confusion as to when services finished at the Bridge Street Church and began at the Castlebar Road Church. Further research is currently under way to clarify events. The results will be published here when completed. Fr. 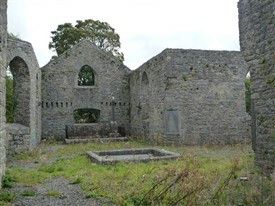 Michael Greene, who is associated with the Church building on the Castlebar Road, is buried in a prominent location within the ruin. His memorial states that he was P de Ballinrobe. He may have been the acting PP until his predecessor Rev. William Burke died in 1827, at the great age of 85 (he lived on Bridge Street, and is buried within Tempall Mór on the Carnalecca Road. It would appear that Fr. 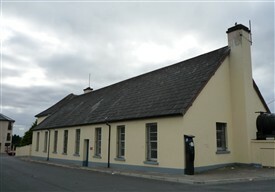 Burke had no role in the Castlebar Road Church building, and continued to use the Bridge Street Church, which was located at the back of Willie Jennings’s butcher shop. Access would have been through a lane from Brewery Lane. A Fr. Edmund Jennings d. 1833 aged 54, is listed as only presiding for four years, and Slater's 1846 Directory LDS microfilm no. 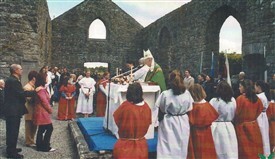 1696703 states that "the Roman Catholic church on Castlebar Road, has the Rev. John Morris, Abbey Street as Parish Priest with the Rev. James O'Malley, Abbey Street and Rev. John Gibbons, Market Street as Curates". A Fr. John Morris d.1850 aged 55 - reigned from 1833 to 1850. A lease for the new Church, St. Mary’s, now located on Main Street was first obtained by Rev. Peter Conway c. 1849. The actual building took many years, due to a lack of funding through the famine times, with its dedication on Pentecost Sunday 1863. Any information would be appreciated on this Church as further research is currently underway. This page was added by Averil Staunton on 04/03/2011.